Chorley showed tremendous character and resilience to come out on top against a very talented Brackley Town side arriving at Victory Park on a 10-game unbeaten run. 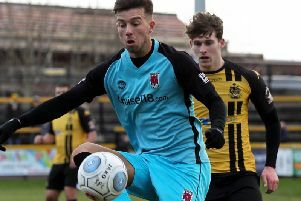 The Magpies repaid Jamie Vermiglio’s faith in his squad after resisting the temptation to make changes following the below-standard display and defeat at Southport. 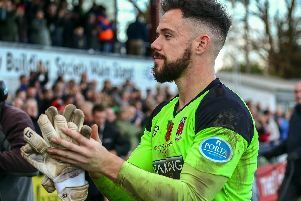 But Chorley were put under immense pressure by their lively visitors in a rousing start to the match, the home goal surviving a trio of narrow escapes and keeper Matt Urwin pulling off a couple of outstanding saves, one of them reminiscent of the late Gordon Banks’ much-publicised World Cup special. The Magpies slowly came more into the game but their opening goal on 38 minutes was their first serious shot of the match. Intricate one-touch passing between the Newby brothers and Adam Blakeman released Alex Newby to the by-line and he centred low across the face of the goal for Marcus Carver to hustle the ball into the net from a yard out. Brackley continued to probe with purpose and pace after the interval but Chorley were now beginning to manage the game more successfully. And they were given valuable breathing space when, after a flurry of challenges in the Brackley penalty area on 63 minutes, the referee awarded a spot-kick, converted with typically calm assurance by Adam Blakeman who induced the keeper to dive the wrong way. This second goal sapped some of Brackley’s belief and though they kept going right to the end, there was an inevitability that the Magpies’ newly-restored defensive confidence would see them through. The three points and 10th home win of the campaign take Chorley six points clear of closest challengers Stockport County with both teams now having 13 games to play.